Our Luxury Double Rooms with Sea View are perfectly positioned for watching pods of dolphins and whales as they swim in the bay below. 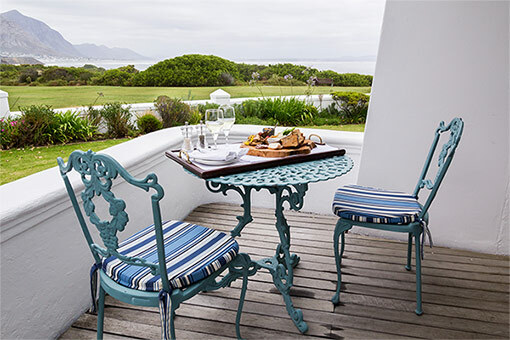 The panoramic views over Walker Bay have inspired the décor of each of the rooms, with blue featuring as a dominant colour. A comfortable seating area makes for the perfect vantage point for spotting the gentle giants below while enjoying a glass of wine. In addition, several of the rooms feature a balcony with breathtaking views of the ocean. King size beds, spacious en-suite bathroom, air-conditioning and under-floor heating throughout ensure the ultimate comfort.